I&apos;ve been active throughout my life. I grew up in the suburbs of a large town that had forests around and my friends and I would go running, biking, and exploring. Because of my distance from other places, I always walked and ran to several destinations. I entered the gym for the first time five years ago at age 21. What began as a hobby, turned into a habit that changed my life. Now I can&apos;t imagine living without the gym and healthy nutrition. Out of all the training programs I tried, I saw the best results for a power and hypertrophy mix method inspired by Layne Norton&apos;s PHAT. "I can&apos;t imagine living without the gym and healthy nutrition." "Motivation and inspiration are locked inside your head along with fears and limitations. You must control them." Bodybuilding won&apos;t provide immediate, short-term results. It requires you to work, suffer, and feel pain. It&apos;s difficult and that&apos;s what drives me in all aspects of training and dieting disciplines. Bodybuilding became my lifestyle and I couldn&apos;t live without it. It became a part of me. "No citizen has a right to be an amateur in the matter of physical training. What a disgrace it is for a man to grow old without ever seeing the beauty and strength of which his body is capable." I&apos;m my own inspiration. I drive myself to be the best I can be mentally and physically. Motivation and inspiration are locked inside your head along with fears and limitations. You must learn to control them. I have no idea where bodybuilding will take me. My current plans are to start competing internationally and go for a pro card. I believe in hard work, consistency, and intensity no matter the goal. If you don&apos;t get tired from training, then you&apos;re not working out. Get in the gym, destroy your workout, and get out in 45-60 minutes. Get 8-9 hours of uninterrupted sleep per night and eat good, balanced meals. I love Kevin Levrone&apos;s symmetry and body balance. He&apos;s the uncrowned Mr. Olympia, in my opinion. I use BodySpace to connect with people and exchange opinions. It&apos;s a good place to find different approaches to dieting and exercise. I read most of the training, dieting, and lifestyle articles. I also visit the forums regularly. It&apos;s a great place to gain knowledge. Amateur Bodybuilder Of The Week: Build Mass And Stay At 10 Percent Body Fat! Brian isn&apos;t afraid to face the reality of bodybuilding and embraces the challenge. Get the intense training plan he used to pack slabs of muscle onto his 6-foot-3, 265-pound frame! Amateur Bodybuilder Of The Week: Jay Carved Out A Chiseled Body! Jay lifts with relentless consistency and maintains a strict diet to push his body to new heights. 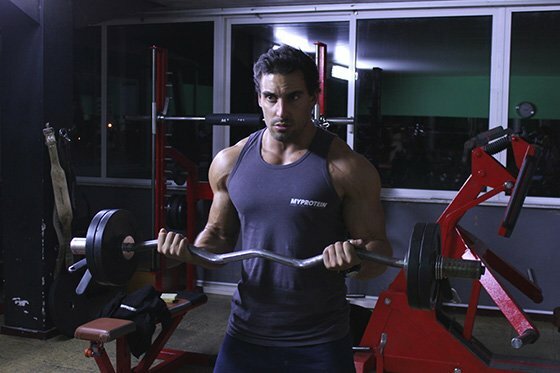 See the methods he uses to build quality muscle and symmetry!